You have seen an 80% increase in the number of children who were read to on World Read Aloud Day from 2017 to 2018. Why did it increase so much? The Nal’ibali campaign launched in June 2012 and less than a year afterwards we held our very first World Read Aloud celebration. We reached just over 13 000 children and were very proud of this achievement. Back then we had no idea that South Africans would enjoy the day so much that the number of children read to would more than double every year. This year our aim was to motivate South Africans to read to a million children. We believe that this was achieved because of our team’s commitment to mobilisation and our growing network of partners which increased exponentially between 2016 and 2017. We’ve always known that if we want to establish a culture of reading in South Africa, our role is to provide the spark that others will carry forward. Did you take a different approach to marketing this year? Marketing and media engagement is an essential component of our work. We need to keep sharing the good news, information and opportunities that will inspire and motivate adults to read and share stories with children. 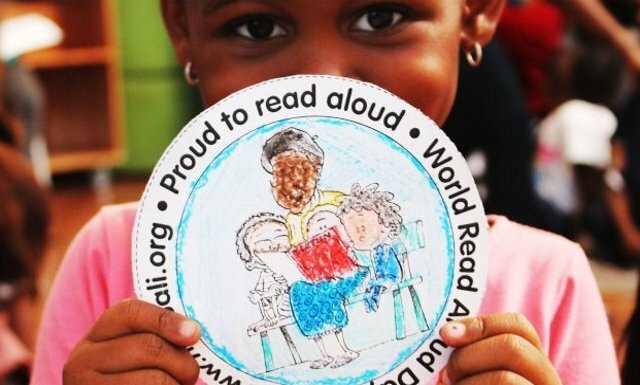 This year World Read Aloud Day came hot on the heels of the devastating PIRLS results showing that 78% of Grade 4 learners cannot read for meaning in any language. Many concerned citizens, industry organisations and media were anxious to take positive action and to mobilise others to do the same. We executed a concentrated multi-media campaign leading up to and including the day, which generated more that R2 million in free media coverage. National, provincial and community media across South Africa were targeted and we provided tailored messaging tied to local events. The message was further amplified through our media partners, Tiso Blackstar, with coverage in select newspaper titles and online sites, as well as SABC Education, with radio stings going out in six languages across seven stations. In addition to our usual social media amplification, our own digital marketing efforts saw us receive a total of 153 000 impressions over two weeks on paid platforms including News24, Izindaba24 and Daily Maverick. Unpaid platforms garnered 181 959 impressions over two weeks. This resulted in Nal’ibali’s WRAD hashtag #WRADChallenge2018 trending on Twitter for over eight hours on the day, reaching more than 500 000 people. Thus, through our marketing efforts a lot of noise was made, thanks mainly to the radio and TV coverage, but it’s also due to how we planned and consolidated efforts, leveraging our partners, and also that we made it really easy for people to participate! Do you think this success is an indication that the idea of reading for joy to promote literacy development among children is gaining ground? Certainly. Support for the drive is growing and South Africans are starting to own it – promoting and publicising their involvement in the drive themselves. What excites us the most is repeat participation where schools, libraries, members of the public come back year after year to join the celebration. For children to experience the benefits of books and stories, it needs to be part of daily life and become a habit. We encourage those who joined us on February 1 to keep reading to their children in their home languages, even for just 15 minutes a day by accessing our platform for stories and other literacy materials in a variety of official South African languages. Now that more than a million children and thousands of adults have had a taste of Nal’ibali, we’re sure demand will continue to grow and next time they interact with, or come across Nal’ibali, they’ll be more eager to engage, more likely to take action and more receptive to our messaging. How do we build on this momentum from here? We currently have a network of 2 434 reading clubs reaching approximately 63 000 children across our nine provinces – our programmatic focus will be on four key provinces which have the highest concentration of children. These are KwaZulu-Natal, Limpopo, Gauteng and the Eastern Cape. We’re also excited to announce that a mass media campaign comprising billboards and radio advertisements will be launched this year. We’re also working on strengthening our literacy activist or FUNda Leader network so that ordinary citizens can also be part of this national movement and contribute to a society where South African children are not only able to reach their academic potential, but grow up to be empathic, critical thinkers who can to drive and steer our economy. Our message needs to be consistent, visible on all platforms, accessible and clear. Our actions need to model what South Africans can do to drive change. Our campaign needs to increasingly situate itself as the go-to hub for people across the country to access information, free resources, and easy how-to guides to assist them in picking up the baton. Ultimately our goal is to make it clear that the literacy crisis in South Africa can be fixed with a relatively modest investment of time and resources, and that it’s up to us all – business, state and civil society – to turn the situation around. Events like World Read Aloud Day are perfect examples of how this can and should happen. 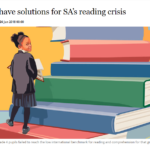 You can read an article in which DGMT CEO, Dr. David Harrison, responds to the PIRLS results here: We do have solutions for SA’s reading crisis (first published in the Mail & Guardian in January 2018).